Even with a mounting TBR I tend to have an idea of what books I want to read in the near future, although I am very much a mood reader so I don't set anything in stone; I make a stack of books that I think I'll read soon. Today I want to share ten of those books from the stack - ten books I hope to read before summer rolls round. There were a lot of highly talked about and much anticipated book releases in 2015, but one that stuck with me is The Wolf Wilder - I purchased my copy in December and hope to get round to this middle grade adventure very soon, whilst winter is still upon us. I feel like the cosy winter weather will only add to the atmosphere of this book. Sticking with children's historical fiction we move on to Brian Selznick's 2015 release, The Marvels. I very much enjoyed The Invention of Hugo Cabret by the same author, and look forward to seeing how this book plays out being told in a similar format. Why I've put off reading this children's classic for so long, I don't know, but 2016 is the year I rectify not having read any of The Chronicles of Narnia. I love a good mystery thriller and You was probably one of the most talked about within the genre in 2015. I did actually pick up my copy a couple of months ago, I just haven't got round to reading it yet. I've tried reading some of Murakami's work before, starting with 1Q84, but I just really couldn't connect with the story. After a couple of unsuccessful attempts, I abandoned the book, however I didn't write off the author entirely - I'm hoping to have better luck with this novel. If you've read Murakami, I'd love to know which books of his you've read and enjoyed. The Miniaturist has been sitting on my shelves for a good few months now and I feel like it's time I get round to reading it really - I hope it's as wonderful as I've heard. I discovered Patricia Highsmith's writing early last year by reading The Talented Mr Ripley, and now I just want to devour all her work because she is my kind of author - I wish I had took the time to read her stories sooner! Another much talked about book of the past year or so, I'm really intrigued by the premise of this one. In 2015 I read the much acclaimed Still Alice and was totally blown away by Lisa Genova's writing. Since then I've acquired a couple more of her books and have opted for Left Neglected to be my next read by her. I've a few of Roald Dahl's short story collections sitting on my bookshelves, and am actually a part way through this particular one. I'm making it my mission to finish this collection in the first half of the year because I honestly think my bookmark has been in the same place for close to a year now, which is pretty terrible, especially seen as I am enjoying the stories! If you'd like to see what other books I have sitting on my TBR, then be sure to check out the tab page up the top of my blog where I have a full detailed list of my TBR as it currently stands - I update it on the first of each month. What books do you hope to read in the first half of 2016? Quite a variety!! I enjoyed Left Neglected, I hope you do too. I love variety in reading - I tend to slump if I read too much of the same thing; I've noticed that over time. I'm looking forward to Left Neglected. I know I've only really discovered Lisa Genova, but I see her writing becoming a favourite. I keep trying to read Murakami as well. Everyone seems to love him but I have a hard time with them. I've had Hard Boiled Wonderful and the End of the World on my shelf for over a year now. Oh, what a wonderful job! The Wolf Wilder is a wonderful winter read (all those w's weren't intended there! ), if you don't get round to it this winter I'd highly recommend saving it until next winter. The illustrations really heighten the reading experience of The Wolf Wilder. So I'm not the only one who struggles with his work?! I've heard that the book I delved in to his writing with - 1Q84 - wasn't his best and that's why I'm hoping a different novel will shed a little more light on his writing. Sometimes though we just can't connect with a certain author and their writing style, unfortunately. I love that cover of Dawn Treader on your picture, I've never seen that one and it's very nice, with the seagulls high above. That was my favorite Narnia book I think, though as a kid I liked Horse and his Boy too. 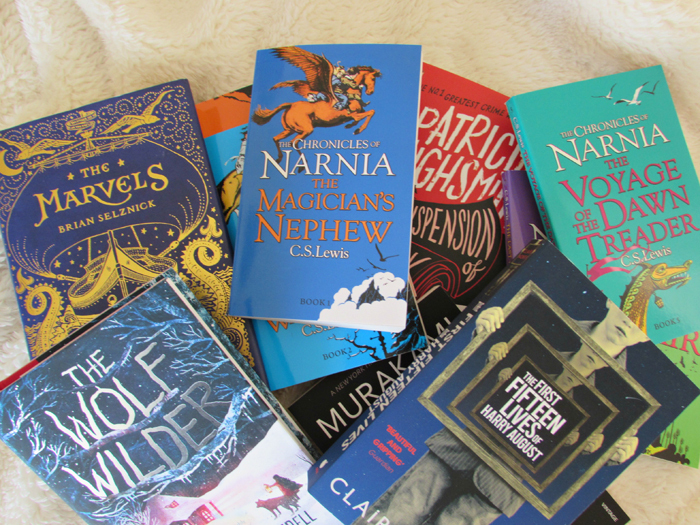 So far I've finished The Magician's Nephew and The Lion, the Witch and the Wardrobe - I love it, I want to adventure to Narnia! My particular edition of The Chronicles of Narnia was bought as a box set and were only released last year. I love the cover art - not only are they fun and vibrant but the images relate to the stories in the most wonderful ways. Haha - I'm such a slow reader I don't like to set monthly TBR's. I think it's good to have goals such as this regardless of the given period of time. I look forward to seeing what you hope to read in February.